This tab allows to add products to the order, define a discount and set a product price manually. This tab also displays the parts of each product, as well as its properties and description. The table at the top of this tab, displays the selected items for this order and includes the quantities and prices. Some of these fields can be modified by the user. The prices can be changed by defining a discount or alternatively by using the Set Product Price Manually button. By choosing a product from the table above, its details will be displayed and will include the product tree, its properties and a list of optional measures for any measure that was defined as changeable in the product card (these values color is purple). This button opens the products catalog. The required product can be selected from the virtual menu, as was defined in the "Virtual Menu" tab of the Product Design Module. 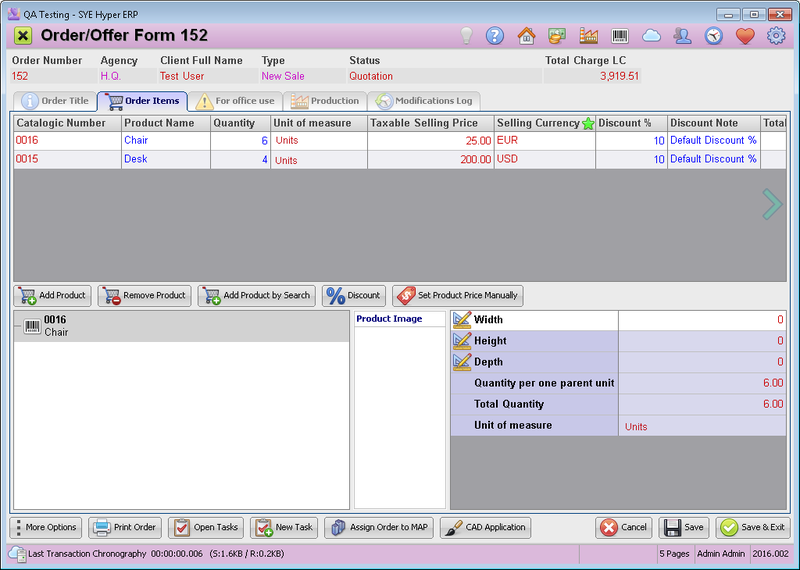 The user can choose the required product from the displayed products folders. Search - search the list of products for the required product. Private Price List - Search the Private Price List (as defined in the "Rules" tab) for the required product. Committed Prepaid Products - Search the Committed / Prepaid Products List (as defined in the "Rules" tab) for the required product. The selected products will be added to the Order Items list. In order to remove an item from the list, click on the selected item's row and then click the Remove Product button. This button will display the "Discount" window, where the user should define the Discount % as well as the reason (or any description) for this discount. This button will display "Set Product Price Manually" window, where the user can modify the Selling Price for the product (for this order only).